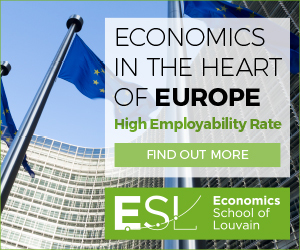 The Economics School of Louvain ESL (UCL) - and the Economics School of Namur - ESN - jointly organise the master programs in economics both in the Louvain-La-Neuve and Namur's campuses. 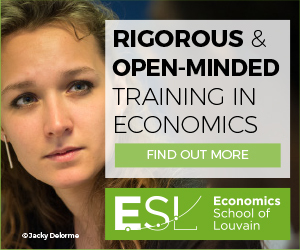 RIGOROUS & OPEN-MINDED TRAINING in economics. 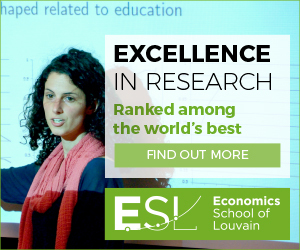 Teaching & Research excellence: ESL programs are world-ranked 17° out of 17.000 programs in 154 countires by Eduniversal. 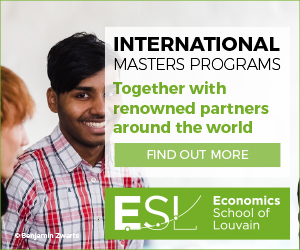 STRONG INTERNATIONAL EXPERIENCE: ESL has developed a network of partner universities for EXCHANGE STUDENTS and DOUBLE / JOINT DEGREES. A school of economics close to Brussels, capital of the European Union hosting a lot of headquarters of EUROPEAN and INSTITUTIONAL institutions. PLENTY JOBS OPPORTUNITIES for young graduate students. Le Pr. Jean Hindriks a été interrogé par le RTLinfo 13H du 6 septembre à propos des disparités entre réseaux dans l'enseignement belge. Le Master en économie de l'ESL dans le top 20 européen !